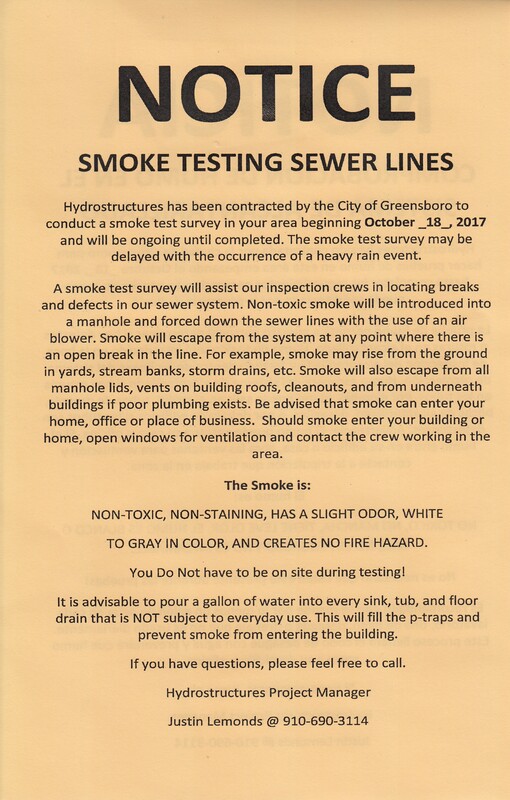 Beginning Wednesday, October 18, the City of Greensboro and contractor Hydrostructures will be performing sewer line smoke testing in various locations throughout the City for three to four weeks. This is part of the City’s effort to continue to monitor and improve its infrastructure conditions. View a project location map of the testing areas here. During the survey, a non-toxic smoke will be introduced into a manhole eventually flowing into the sewer lines. Any open break in the sewer line will be identified by the presence of smoke. The smoke is non-toxic, non-staining, has a slight odor, and will appear white to gray in color. The smoke does not create a fire hazard. To prevent smoke from entering into a structure, customers are advised to pour a gallon of water into every sink, tub, and floor drain that is not used on a daily basis. Motorists traveling in the project location sites may experience some minor traffic delays. Additional updates will be issued as testing progresses. For additional information, please call the City Contact Center at 336-373-2489 or visit the Water Resources website.